Welcome to the Barnum Family DNA Project! When traditional, paper-trail genealogy fails us, we now have a new tool to help find our elusive ancestors. It’s called Genetic Genealogy and it can allow us to confirm a Barnum link where no conventional source records exist. We've used Y-DNA to confirm several Barnum lines of descent and to find a link to the Barnum family tree for a family whose ancestor changed his surname several generations ago. I’m happy to welcome you to the Barnum Family DNA Project. We use a painless cheek scraping from a Barnum male to obtain DNA that can help accurately determine a family relationship. Females can ask a close male relative to perform the test on their behalf. Analysis of the results will help us to determine who was the common genetic ancestor. One of our goals is to find the time to the most recent common ancestor (TMRCA). Scientists can calculate that time based upon the observed number of mutations by which two Y chromosomes differ. The reference approach for the Barnum Family DNA Project will be to develop groups of matching DNA sequences and to cross reference that information against the oldest known ancestor. Once again, welcome to the project! 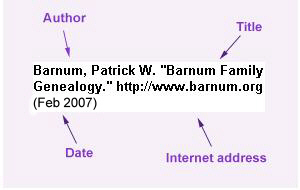 I hope that you’ll enjoy the experience and that it will enrich your association with Barnum family genealogy.